When I was a wee fellow, I could transform tree branches into ray guns, bed sheets into fully functional flight mechanisms, and crawdads into intergalactic sea creatures. My dirt-scrapingly dull pocket knife could save the world, and on particularly clear nights I could ting a pebble off of the moon with my slingshot. I was a kid: oblivious, blissful, and overflowing with wonder. Reminiscing is a means by which we explore our various eras, phases, mistakes, and elations in order to evaluate the person/s we have become. At the very least , reminiscing allows us a means by which we may perpetuate our child-like wonder, re-explore that which defines our respective constructs of love, or lack of love—the pigeon-toed girl wearing the stretched out V-neck T-shirt, the gentle neo-hippie prancing barefoot in the sand—reminiscing is visceral, terrifying, addicting, thick, and adjective upon adjective upon adjective. However, in its purest incarnation, reminiscing simply takes us home. In Mel Bosworth’s debut novel, Freight, we find ourselves led through a non-chronological-if-you-so-wish collection of encoded memories by our nostalgic narrator: a nameless, occasionally matter-of-fact, occasionally hyperbolic fellow who is searching—for that which is largely determined by the respective conglomeration of muck and paper airplanes and funerals and laugh-until-you-cries which coalesce uniquely within each of us—but ultimately, our narrator is searching for that place he defines as home, whether figuratively or literally. Iconic objects permeate this multi-tiered search and each performs a specific, often overwhelmingly polar emotional function: tackling a freshly built snowman, our narrator’s hands coming together as womb, results in a profound declaration of love and demonstrates the lengths to which our narrator will go to express his love, even if only for his recently destroyed snowman. This type of behavior thickly populates Freight and ensures that we challenge our own mastery of self-awareness. Despite the heft of the freight with which our narrator is grappling, we know that he knows what he likes and in this knowing we connect intensely, almost telepathically with our narrator and fight through the muck to rediscover, and possibly redefine home. Sometimes, however, our narrator confuses those items he likes—cedar chest as time machines, a cute, drunken blonde girl—for those inherently deep affirmations he needs: it’s okay that he assassinated the baby birds when he was husky; it’s okay that he can’t fix everything. In both this confusion as well as in the numerous snapshots stuffed with tranquility and clarity, Freight reminds us to savor every moment regardless of where each may land on the good/bad spectrum and to remain relentlessly and unapologetically alive. After all, that is what the search is all about, right? 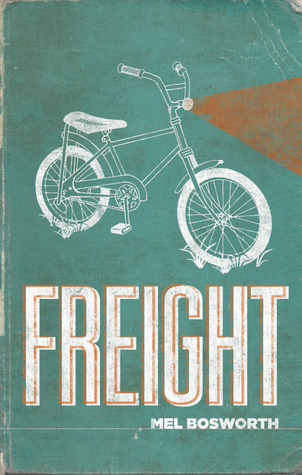 Sign into Goodreads to see if any of your friends have read Freight.